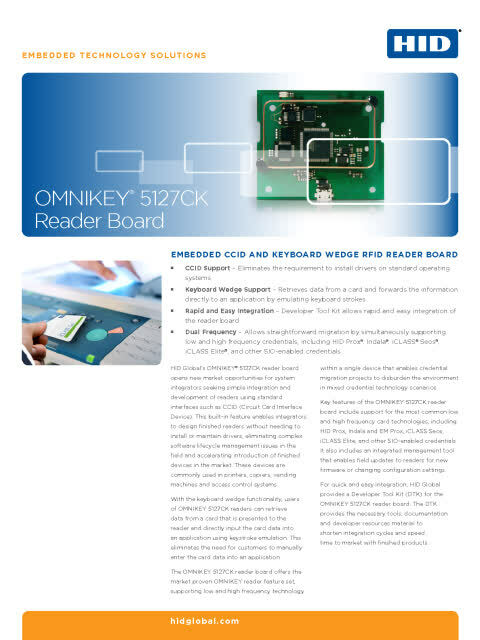 The OMNIKEY 5x27CK readers provide a solution for CCID and keyboard wedge applications. CCID support allows reader installation without the need to install or maintain drivers, eliminating complex software lifecycle management issues in the field and accelerating the time to market. These devices are commonly used in printers, copiers, vending machines and access control systems. With the keyboard wedge functionality, users of OMNIKEY 5x27CK readers can retrieve data from a card that is presented to the reader and directly input the card data into an application using keystroke emulation. This eliminates the need for customers to manually enter the card data into an application. For additional information please register your License Key online.